This product is expected to ship on Wednesday, April 24 if you place your order within the next -6 hours and 29 minutes. It’s common for those who have their own office to want to display their names proudly on their desk as evidence of their achievement. There is something about a good custom name plate that grants a professional atmosphere to an office, especially when it’s made from a classic hardwood like our handsome walnut. But sometimes you don’t only want to impress anyone who walks into your office, you want to create a lasting impression when they leave. Business cards can help with this, but having a separate card holder can add needless clutter to your desk. In order to minimize the distractions, and maximize your impression, our walnut desk wedges are a perfect way to promote yourself. 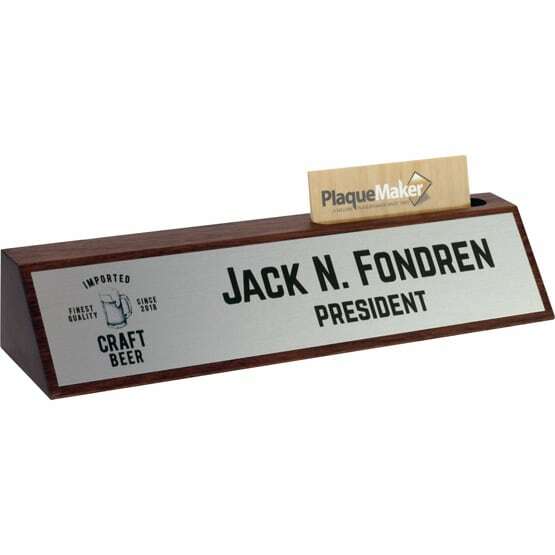 We at PlaqueMaker.com have created a great looking solution that leaves both an initial and lasting impression: a walnut desk name plate with a business card holder. This handsome desk wedge will enrich your office space while allowing you to give out contact information to clients. Our robust walnut desk wedges are crafted out of quality hardwood and come with a business card holder for standard size business cards. 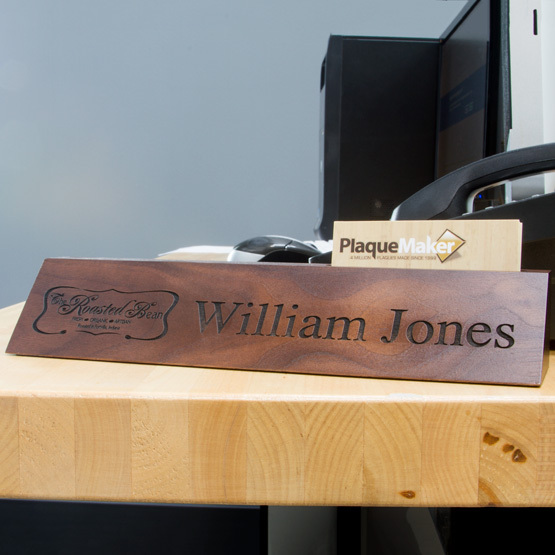 With our walnut desk wedge, you can either engrave directly into the surface of the desk wedge, or you can have a custom name plate added to the front to display your name and title. There is no limit to displayable text. You can even add a photo or logo to your name plate. 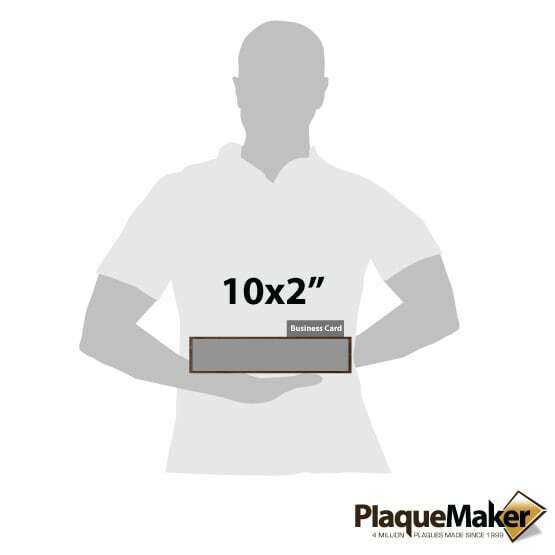 We at PlaqueMaker.com have put together a unique set of online design tools that make designing your name plate simple and easy. You can use these tools or allow our team of graphic designers to design a custom name plate for you. Simply enter your specifications into the order form and we’ll get started. Don't need the slot for business cards? Check out our Walnut Desk Wedges. Overall Size: 10 x 2 3/8"
Personalization Area: 9 x 1 1/2"